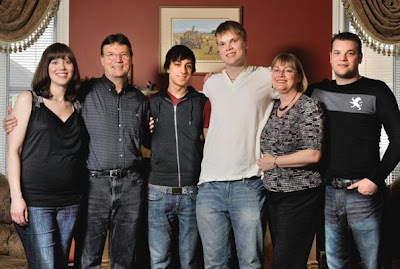 Scott Heggart's family, from left, are Sonya Long (sister), Randy Heggart (father), Brock Doivon (boyfriend), Scott Heggart, Julie Wilson (mother) and Russell Heggart (brother) . 19-year-old Canadian hockey player Scott Heggart opens up to Kevin Newman from the Canadian Television Network on his coming out and new-found activism. Scott as a tenth-grader began a video project that made him a YouTube sensation. He had documented his coming out by posting a YouTube video every day for a year. The videos included his thoughts about being gay, being gay in sports and interviews with family members. Canadian Television Network just aired a lengthy special on Heggart. In the special, Heggart talks in detail about his near suicide attempt as he was coming out of the closet. CTV also dives into his coming out in the locker room. It's a must watch. Unfortunately the video is unembedable. You can watch it here. It is worthy of your time.